Cardiff City have signed wide midfielder Mark Kennedy from Crystal Palace on a free transfer. The Dublin-born former Republic of Ireland international, 32, made seven appearances for Palace last season, the last coming in November. 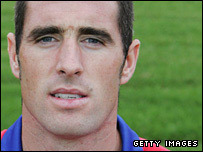 Left-sided former Liverpool player Kennedy has worked alongside Cardiff manager Dave Jones before - at Wolves. "We need a squad of 22 players to compete, Mark is a welcome addition," said Cardiff boss Peter Ridsdale. Is Kennedy a good signing for Cardiff? "He is an experienced pro, an experienced international and will add some competition, which we need. "He can play on the left, but also in the centre of midfield where we need more bodies available." Kennedy became the most expensive teenager in British football history when he moved from Millwall to Liverpool in March 1995 for a fee of up to £2.3m. He then made three more seven-figure moves, to Wimbledon and Manchester City, before being signed for Wolves by Jones, who paid £2m to take him to Molineux almost seven years ago to the day. He played a big role in helping Jones win promotion for Wolves in May 2003, having also gone up with City two seasons previously.